Barcelona has something of a reputation when it comes to crime. Which is what you’d expect from any Mediterranean city packed to the rafters with tourists, sailors, hookers and grifters. It’s not exactly a dangerous place (Barcelona has a very low homicide rate) but plenty of bags get stolen and plenty of people get gypped. 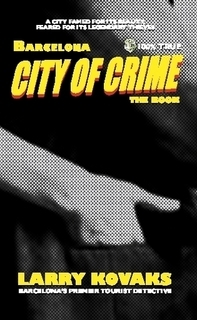 And that’s exactly why this city needs someone like Larry Kovaks whose latest (and first) book, City Of Crime, tells the story of one man’s fight against the ne’er-do-wells and miscreants (‘gypmeisters’) of the Ciutat Vella. Consisting of a series of stories set in Barcelona’s old quarter, City Of Crime introduces the reader to the scams, tricks and mischief that take place right under any visitor’s nose. From illicit Chinese brothels (one has recently opened here in Cerdanyola, so the flyposted adverts say) to villainous dwarves, Kovaks lays bare the criminal heart of the city as well as its sordid underbelly, all in the gravelly voice of an American b-movie detective. Kovaks, both the author and the star of the book (though I suspect that editor Andrew Minh deserves some praise for his work on the text), is an impressive beast of a man. His girth is only outsized by his quick wit (for the most part) and possibly his disgust with the bad boys and girls of Barcelona’s underworld. Fuelled by Ducado cigarettes, Voll Damm beer and Mascaró brandy, Kovaks fearlessly confronts the Tracksuit Mafia through the cold, piss-streaked streets of the Raval, like an 18-stone angel. Much of the material in City Of Crime has been published on the web, both at Kovaks’s own website and in the pages of The New Entertainer. However, that shouldn’t deter readers from buying the printed edition which is attractively bound and features a brand new installment, The Danger Of The Perfect Brunette. My only criticism of the book would be that some of the earlier stories are somewhat short: this is a character who really comes into his own in the longer episodes. A joy for residents of the Catalan capital and a forewarning for visitors, City Of Crime left me hungry for more. We can only hope that Kovaks, wherever he may be, gives us more of the goods in future editions. Buy the book online from Lulu here. Is TV3 the anti-Catalanista channel? At least three people think so. Personally, I’m not sure whether the event in Sabadell merited much more coverage or not. But it probably could have replaced ‘1,000 march in Mallorca against corruption’. 3Cat24 is, after all, supposed to be about news in Catalonia.